The Secretary for Innovation and Technology, Mr Nicholas W Yang, has told German entrepreneurs that the consensus reached by China and Germany on accelerating co-operation for "Industry 4.0" and "Made in China 2025" will lead to significant business opportunities for German innovation and hi-tech industries. 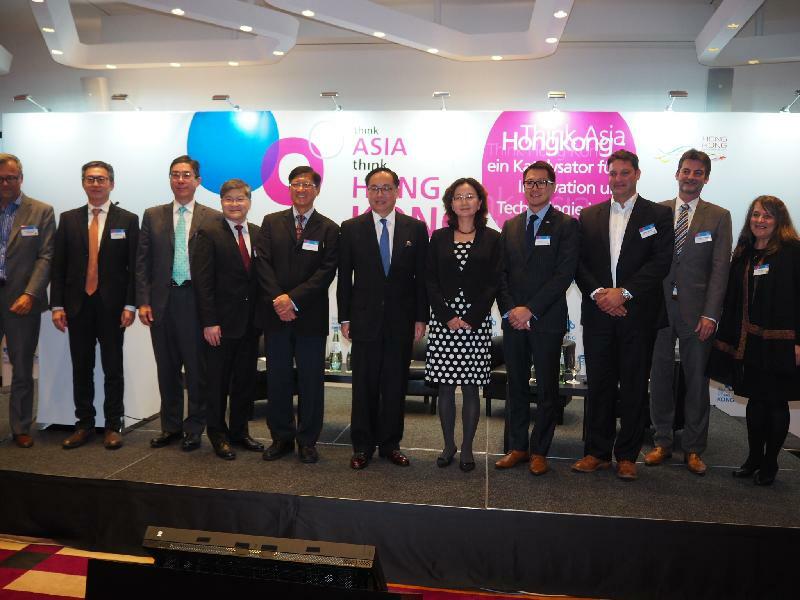 The remarks were made at the "Think Asia, Think Hong Kong" - Technology Seminar co-organised by the Hong Kong Trade Development Council (HKTDC) and the Hong Kong Science and Technology Parks Corporation in Munich today (September 29, Munich time). "Given our unique advantages, Hong Kong would be the ideal base for localising and testing German technologies before they enter the Mainland market," he said. 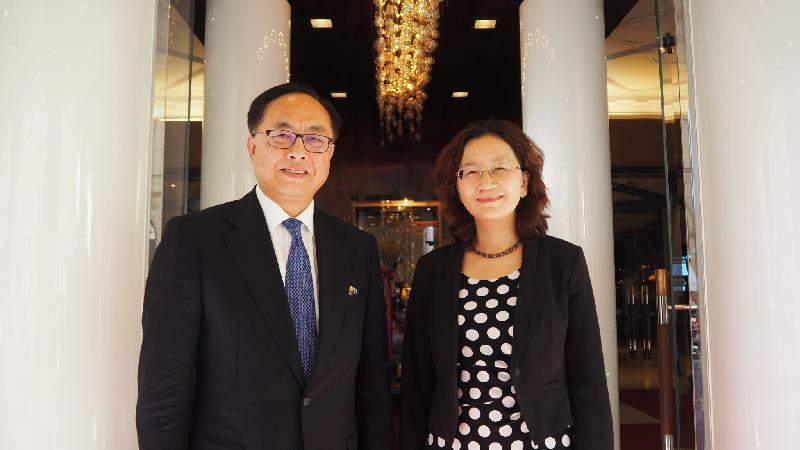 Mr Yang said that to fully grasp the opportunities of the "Made in China 2025" strategy, one of the mandates of the Hong Kong Government is to drive the "re-industrialisation" of Hong Kong by focusing on three areas: robotics, healthy ageing and smart city. "We will promote smart production and research at our industrial estates, injecting some 950 million euros into two pilot projects - an Advanced Manufacturing Centre and a Data Technology Hub. "Incorporating robotics and information technology, advanced manufacturing industries will supercharge the entire value chain covering R&D, design, production, testing and marketing and branding. This will also help diversify our economy, which at present is more than 90 per cent service-based. "Our long-term goal is to revolutionise Hong Kong's manufacturing industry and revitalise the 'Made in Hong Kong' brands to propel economic growth," he continued. Mr Yang noted that the Belt and Road Initiative is a pivotal China strategy certain to take collaboration between Germany and Hong Kong to new heights. "The Central Government has expressed clear support for Hong Kong's participation in the Belt and Road Initiative. Hong Kong will serve as the Belt and Road's 'super-connector' in traditional industries and also in emerging sectors such as innovation and technology," he added. 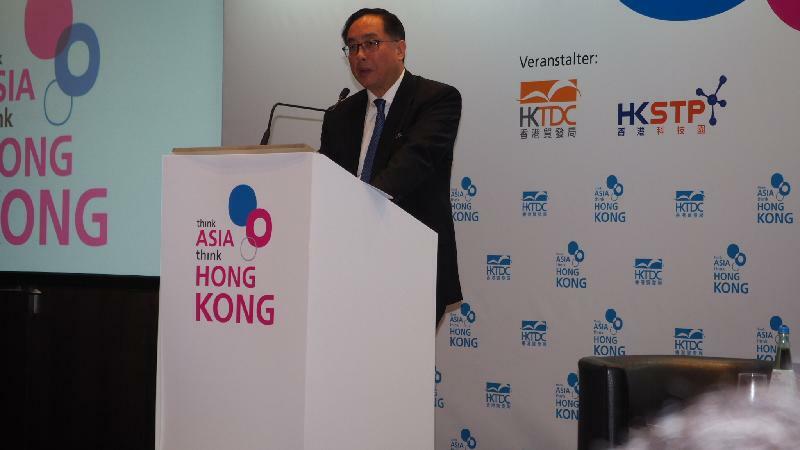 Mr Yang encouraged more businesses, entrepreneurs and investors to turn to Hong Kong in exploring the unprecedented opportunities arising from the Belt and Road Initiative. A courtesy call on the Chinese Consul General in Munich, Ms Mao Jingqiu, was made after the Technology Seminar. During his three-day visit to Germany, Mr Yang also joined the HKTDC Technology Mission to visit the Siemens electronics plant in Amberg, which is a prime example of a digital factory, and Stäubli Tec-Systems GmbH, which specialises in the development, manufacturing and sales of six-axis and SCARA industrial robots. A deeper understanding of the practice of "Industry 4.0" in Germany, in particular the current status of production automation, was gained while collaboration among enterprises of the two sides in "re-industrialisation" was fostered. Soon after his arrival in Frankfurt on September 27, Mr Yang visited Fraunhofer IGD, a leading institute for applied research in visual computing, and Arago, a German software engineering company for artificial intelligence. With the conclusion of his three-day visit to Germany, Mr Yang will depart Munich tonight and arrive in Hong Kong tomorrow (September 30).